The calendar has flipped over to September and the temps are dipping enough to wear a sweater. Hooray! My favorite time of year is here! Just a few weeks away from Halloween - our costumes are way ahead of schedule but I haven't even started on decor. There is always next weekend. 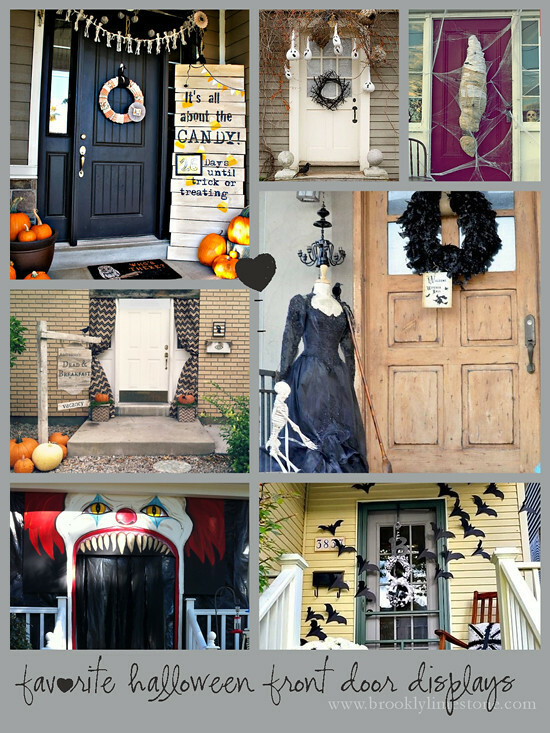 With that in mind, kudos to these fellow Halloween lovers who outfitted their front door so well I had to share. I love how each interprets the holiday in their own fun way. Lots more Halloween goodies coming up in the coming weeks. If you have a Halloween project to share, don't be shy - I don't bite (much). That clown door is just plain terrifying! I can't wait to see what you come up with for your home this year. I look forward to it every Halloween!